More of the same from the gaming giant? 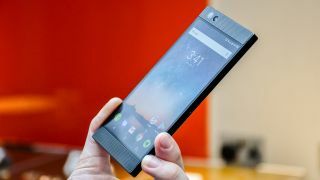 The Razer Phone 2 is coming - we know that for sure afrer the firm confirmed the handset in an earnings report - but it looks like things may not change all that much from the original Razer Phone, in terms of design at least, if the latest leak is to be believed. An image obtained by Android Headlines from a 'reliable source' claims to show the front of the upcoming Razer Phone 2 and it looks awfully like its predecessor (which is pictured in the image above). There is a subtle difference, but you'll need to study the two handsets side-by-side. The Razer Phone 2 appears to have slightly thinner bezels above and below the screen - but they're by no means small. This suggests Razer will use the powerful, front-facing stereo speakers from its first handset in the Razer Phone 2 as well. What will the new Razer Phone offer? On this evidence, it appears Razer is also sticking with a 16:9 screen aspect ratio, which is fast falling out of favor with most of the major phone manufacturers who are stretching their displays to 18:9 and beyond. Of course, this leak needs to be taken with a pinch of salt. It could easily be a render knocked up by a fan, or if the source is a reliable one, a concept render from Razer which may not reflect the final design. Other rumors suggest the Razer Phone 2 will pack a Snapdragon 845 chipset, 8GB of RAM, Android 8.1 and may even come with a light-up Chroma logo on the rear - much like on the firm's computing devices. We're yet to hear any news on a Razer Phone 2 release date, but seeing as its predecessor arrived in November last year we expect the new handset to land in the same month this time around.